Many leading Serpents of Wisdom were quietly drawing up plans for what was to be a model nation across the western sea. Referred to within closed circles of initiates as the New Atlantis. This new land was to be governed by the Serpents of Wisdom elected by the people and for the people. In reality Europeans already new about the new world back into the time of the Vikings as the North American rune stones prove. It's also been shown many of the Templar's had bases in America going back to their day. America was the goal of the Free Masons, a nation free of the Catholic/Jewish grip, and where they could create a nation based on solely Luciferian principles. This plan was put into work over a hundred years before the official revolution. Starting in the late 1600's members of the Free Masons began leaving their comfortable lives behind in order to undertake the long arduous journey across the Atlantic Ocean to become citizens of the New Land of the Phoenix. 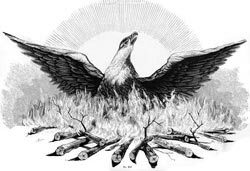 Once in America they proceeded to organize a cohesive network of Rosicrucian and Free-masonic Lodges within a nation of 13 colonies the ancient number of the Phoenix Dragon. In 1694 a Rosicrucian colony was established in Pennsylvania and by the early 1700's Free-masonic Lodges were literally sweeping across the new land. By the beginning of the Revolutionary period there was a multitude of common lodges and seven (the number of the Serpent) Grand Provincial Lodges scattered evenly throughout the Thirteen Colonies. One of the favorite forums of the Freemasons in Boston was the Green Dragon Tavern, where Daniel Webster referred to as the headquarters of the revolution. During a frenzied meeting at this tavern a plan was hatched to resist the British tariff on tea by destroying a new shipment of the commodity residing in Boston Harbor. It was decided that on the night of December 6, 1773 a group of Freemasons of Saint Andrew's Lodge would disguise themselves as Native Americans, clandestinely board the tea ships and toss the cargo overboard. This act was to become an unforgiving thorn in the side of the British Crown and a full scale Revolutionary War was declared soon afterward. The North American Freemasons pooled their resources in order to organize a formidable resistance against their oppressive rulers. They chose the Rosicrucian and Master Mason George Washington to supervise the building of an army and brought over from Germany Freemason Baron von Steuben to instruct the virgin troops in the art of battle. The Colonial Army was a Military Lodge and a Who's who of American Colonial Freemasonry. Over 2000 of its officers were Freemasons and out of these at least 100 were generals working directly under Washington. Many high ranking officers were also Free-masonic Grandmasters. Included in this elite list was Washington, Paul Revere and Joseph Warren, the Grandmaster of the Massachusetts Grand Lodge who became famous for sacrificing his life while leading a battalion up Bunker Hill. It should also be noted the American Freemasons also had many allies in the British government and military who where also committed to the creation of the New Luciferian Nation, and helped to secure the creation of this nation from behind the scenes. It has been noted during many pitched battles, masons on both sides would make the masonic signs to each other. Following their victory in the Revolutionary War, two important documents were drawn up by the Freemasons in Philadelphia, a city ostensibly named after Philadelphes, the name of the Supreme Secret Society of Freemasons in France. The first of their documents, the Declaration of Independence, was authored principally by the Freemason Thomas Jefferson and signed primarily by the high ranking Freemasons, of the 56 signers of the document, 50 were Freemasons, including the Grandmaster John Hancock. After the Philadelphia Convention the government of the United States began to take concrete form as the country's first President, the Free-masonic Grandmaster George Washington, was sworn in by Robert Livingston, Grandmaster of the New York Lodge. With hordes of attending Freemasons cheering the inauguration, a new Nation of the Phoenix was officially born. A similar gathering was held in which the cornerstone of the new capital was lain. This ceremony was executed by the Grand Lodge of Maryland and several lodges under the jurisdiction of Washington's Virginia Lodge. As was his practice, president Washington attended the service in full Free-masonic ceremonial regalia complete with apron. When the wheels of the United States government finally began to turn, the new institution resembled one huge Free-masonic Lodge. Most of the high ranking officials in all three branches of government were either Freemasons or allied with the principles of Freemasonry. While the Grandmaster Washington was presiding over the Executive Branch of the government, John Marshall, a brother master mason from Washington's Virginia Lodge, was chairing the Judicial Branch as its first Chief Justice. The majority of lawmakers in the House of Representatives and Senate were also Freemasons. Of all the early American Serpents who laid the groundwork for the new nation, none is more important than Ben Franklin, a Rosicrucian, Freemason and Grandmaster of numerous secret societies. Franklin created the Leather Apron Club, one of the earliest of Freemasonic Lodges in America. It served as a vehicle for preparing members for citizenship in a yet-to-be-born nation. Following this, Franklin acquired initiation into a Freemasonic lodge in Philadelphia and was alter elected as Grandmaster over all lodges within the state of Pennsylvania. 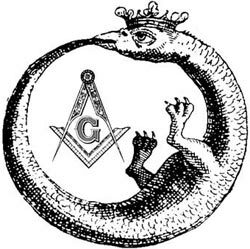 In order to make the Freemasonic rites uniform within the 13 colonies, Franklin composed and published a series of masonic by- laws, manuals and constitutions which served to standardize the rites and philosophies adhered to by the Colonial Serpents. He also published numerous treatises within which he encoded Rosicrucian wisdom along with a call to arms to all those ready to join in the fight for freedom. One of his occult literary vehicles was the famous Poor Richard's Almanac. Franklin's activity also included membership in the esoteric fraternity founded upon the rites and principles of the ancient Egyptian and Atlantean Serpents of Wisdom. It should also be noted, Franklin, while on diplomatic mission in France lived in the main masonic lodge in Paris and was also initiated into French societies. He and his masonic brothers in France got France to become involved in the war in America which enabled the final victory of the Luciferians and the creation of the New Atlantis. Hence why America has the statue of Liberty. A gift from the French masons to commemorate such events. Franklin also used the symbol of the Serpent in many of his works. Franklin is well known for making his own life a reflection of the spiritual principals he preached to other masons. He led a pure spiritual life punctuated by vegetarianism and daily meditation. His prodigious philanthropic activities included the creation of numerous libraries, hospitals and firehouses. Franklin was also a crusader for the creation of positive relations with the Native Americans and eventually became an honorary member of various tribes. Through his efforts numerous treaties were created between the North American tribes and the Unites States government. The Freemason and Rosicrucian George Washington is considered the greatest of leaders during the United States earliest hours. Exhibiting spiritually precocious gifts from a young age, Washington was initiated into the Lodge of Alexandria Virgina as an Entered Apprentice when just twenty years old. Two years later he became the lodge's first Master Mason and later ascended to the degree of Royal Arch, one of the highest of Master Mason degrees. Washington was also honorably inducted into the Mystics of Wissahickon, the American Supreme Rosicrucian Council, which was instrumental in constructing both the Declaration of Independence and the Constitution. When Washington assumed the office of president he was simultaneously elevated to serve as honorary Grandmaster over all the Freemasonic Lodges in the United States. Washington's funeral was an elaborate Freemasonic affair. The service was based upon the ancient Egyptian rites of resurrection and presided over by three Freemasons from Washington's Alexandrian Lodge. Masonic symbols of sprigs of acacia, crossed swords and his apron where placed on his casket. A motion was introduced in Congress by Freemason John Marshall to erect a memorial in honor of the first president. It was decided that the most appropriate monument for the late Grandmaster Freemason was the Egyptian frozen snake, the obelisk. Soon afterwords, in 1793, a special ceremony was held in which the Freemason Robert Mills used square, level and plumb, the symbolic tools of Freemasonry, to lay the cornerstone of what was to become a 600 foot obelisk. The tallest structure of its kind in the world. Benjamin Franklin was a Freemason, Rosicrucian and initiate of the French order of the Nine Sisters, deist Thomas Jefferson was another important Serpent and founding father. An important contributor to both the Declaration and Constitution and under his guidance the first American University was founded in Virginia. Modeled after the Lyceum of Greece and the Alexandrian Museum. Jefferson's university resembled an ancient mystery academy of the Serpents and offered a curriculum similar to that taught within the Museum. Jefferson was chosen by the North American Serpents to oversee the creation of a New Alexandria because of his intellectual and spiritual achievements. He was a recognized adept of most practical sciences including chemistry, botany, anatomy, surgery, zoology, natural philosophy, medicine, mathematics, astronomy, geography, politics and law. He was also an occult genius who had studied the esoteric wisdom and communicated the ancient mysteries through secret ciphers. His work with ciphers or secret codes earned Jefferson the title of Father of American Cryptography.